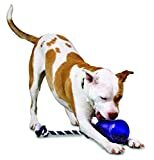 10 Best Toys to Keep Dogs Busy — 2018 — Balls, Smart Toys & More! Whether you are busy at home doing chores or running outside for errands, your dog spends a lot of time alone. Boredom is a huge problem for most dog owners. We all know how it ends: furniture chewing, carpet ripping, and so on. The solution? 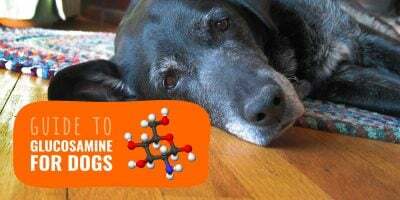 Boredom busters for dogs. Not all dogs love tennis balls, and not all dogs can be given plush toys. As always, when picking the right dog toys to fight boredom, expect your dog to go berserk at them. Be mindful of your dog's strength and temperament when choosing the right boredom busters. 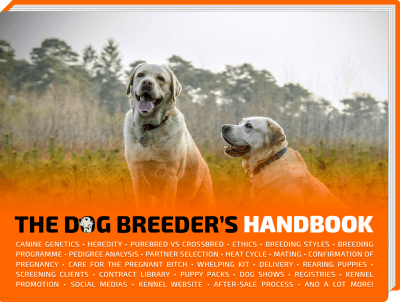 We chose to suggest different types of toys for dogs ranging from bouncing balls to smart interactive K9 games. 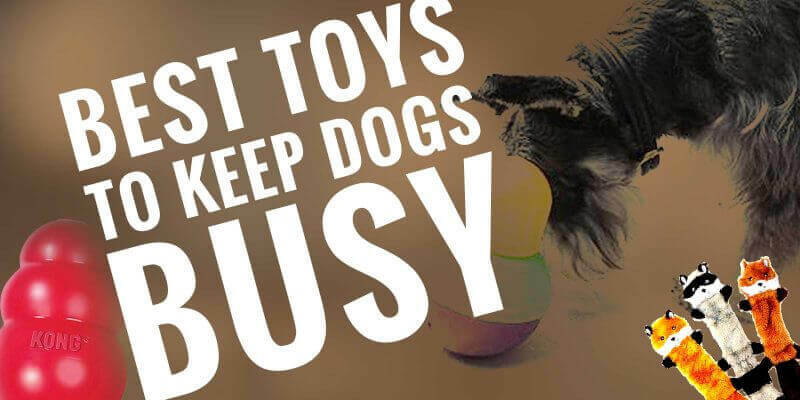 Here are the top 10 best toys to keep dogs busy. ZippyPaws is no stranger when it comes to creating some of the best toys to keep dogs busy and entertained. From a fuzzy, loopy hedgehog that squeaks when you touch it to a comical taco stuffed with furry cheese and lettuce, this brand can't be beaten. When it comes to spoiling your dog, ZippyPaws is renowned for creating those types of boredom busting toys for dogs of all shapes and ages. 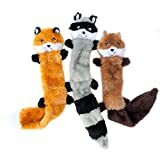 With a measurement of 18 inches long and its unique designs to choose from including a fox, raccoon, and squirrel, these toys are designed to last a long time by eliminating the stuffing that dogs are so accustomed to ripping apart. The ZippyPaws Skinny Peltz comes in a pack of three plush characters to satisfy any dog's ravening play side. These toys were built with safety in mind and are made of the best materials. Each of the dogs comes with three squeakers for maximum entertainment. One great feature is that the toys can easily be separated to give away as individual gifts. Users appreciate the lack of stuffing and not having to worry about a mess to clean up. 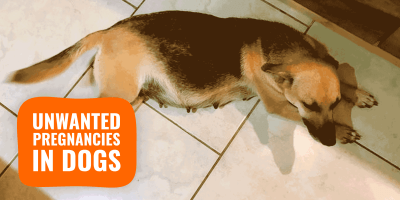 Due to their long shape, dogs can use these toys for a playful tug-of-war game. One buyer claims that his wife is able to throw them in the washer without losing their quality. However, some customers have complained about the material not meeting the guidelines for chewing material so use with caution. 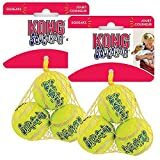 Any dog lover and owner looking for some classic boredom busters for dogs doesn't need to look too far with the multi-faceted Kong on the market. This is not the ordinary dog toy as it serves to aid in your dog in other areas of his life including mental stimulation, relief for teething pups, and even serves as a reliable chewable companion. The Kong happens to be the most recommended toy for dogs by vets, trainers, and canine behaviorists worldwide. Your dog's instincts are greatly stimulated with this chew toy by providing an energetic bounce when played with on the floor that will keep your dog in chasing mode. The Kong Classic Dog Toy comes in a variety of sizes as well as chewing material to fit your dog's individual needs. The Kong types range from “puppy” with soft rubber made for teething, “senior” for older dogs, the durable “classic” for the average chewer, to the “extreme” for those real power chewers. The hollowness of Kong allows for easy treat fillings so that your dog can chase for his food. Some users rim the inside with peanut butter for a real kick. 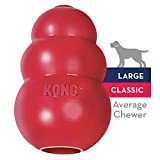 Weighing in at only 7.2 ounces, according to users, the Kong helps greatly with separation anxiety in their dogs, though some buyers have complained of the mess it makes. The Bob-A-Lot made it is way on the top of the list of boredom busters for dogs for its unique, interactive device that allows your dog to play during his regular meals. This toy is sufficiently weighted down with an anti-slip bottom to allow your dog to tackle it without it falling over. While your dog is busy bobbing away, the dual chambers inside the StarMark are designed to dispense his treats in a timely fashion. Just open the top and adjust the slider opening to your liking either allowing food to dispense in quicker or more slowly. You can adjust the bottom opening as well to your desired level, increasing the difficulty each time. The StarMark Bob-A-Lot provides intense mental stimulation for your dog's cognitive functions as well as gives him the daily recommended exercise he needs. His hunting instincts are greatly enhanced while having to “chase” for his food. These toys work exceptionally well for dogs who suffer from dog anxiety. Users appreciate the fact that the Bob-A-Lot can be used on both carpets as well as tile and wood floors. On the downside, however, this toy when used with kibble or hard treats gets very noisy. 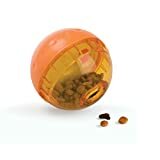 The IQ Treat Ball is another interactive treat dispenser solely designed to give your dog his daily exercise while getting his nutrition for a more active and healthy experience. Your dog can now enhance his IQ while mentally guessing how to get his treats out. Just place his food inside the opening and adjust the slider to your desired difficulty level that aims to challenge your dog and keep him guessing. By tapping his nose on the ball to get his food, the ball will roll causing him to chase it. The IQ Treat Ball is ideal for small and medium-sized dogs and is available in various colors according to your liking. Made of a strong and durable plastic, this non-toxic ball is made to withstand rough play. Cleaning the toy is easy by its twist apart function, you can unhinge the ball with a simple gesture and twist it back together. One user advises putting an old sock around the ball if it gets too noisy on the hardwood floors and cutting off the end to allow the treats to dispense. Although several users say that this ball is not made for small dogs as some have had their jaws and teeth wedged into the opening. Some of the best toys to keep dogs busy and entertained are often times the simple ones. The Omega Tricky Treat Ball earns its name for being quite the trickster. On the surface, it looks like your ordinary ball, however, this ball comes with its nooks and crannies that will keep even the shrewdest of dogs happily impressed. Measuring 5 inches in diameter, the ball's vinyl surface provides the perfect, pliable texture for easy gripping and handling. Just simply fill in the gaps with some of your dog's favorite treats and get the ball rolling. Your dog will be too busy wondering where his treats went, keeping him quite busy for some time. 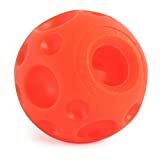 This ball is great for mental stimulation as it keeps your dog constantly on the prowl for his treats. You can choose from a variety of sizes that come in small, medium, and large to fit your dog's unique standard. This is an ideal treat dispenser for those dogs who tend to be fairly fast eaters, in helping slow down his meal time. However, according to several large dog owners, if your dog is an aggressive chewer, this ball may be too thin for him. — Tennis Ball With a Twist! This uniquely designed dog toy serves as a multifunctional, entertainment unit. The Kong Squeakair contains a tennis ball connected to a rope that really enhances your dog's ordinary play. Perfect for fetching, you won't find as many boredom busters for dogs anywhere else when you compare the Kong with several other brands. The best part? It squeaks too, so you get that added auditory stimulation for your dog's play senses. The tennis ball is made of a non-abrasive material to cater to the toughest chewers and won't break down their teeth. The rope attached to the ball measures roughly 15 inches in length. 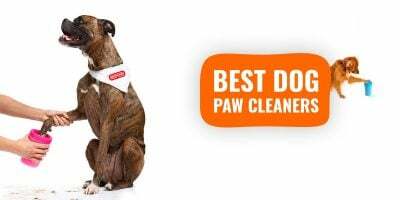 Additionally, Kong designs its products with your dog's physical health in mind as well. Dogs are filled with energy and this toy is built to keep him on his feet. Dog owners love it because they say it's a great device for their favorite tug-of-war games. However, as entertaining as it is, several users complain that the toy didn't last long due to the fabric being too weak or the ball not being sufficiently attached to its rope. — Puzzle Treat-Dispensing Dog Toy! For those really aggressive and tough dogs, the West Paw Zogoflex is the perfect play commodity to satisfy their urges. This toy features a treat dispenser while engaging your dog in a puzzle mania. Made in the USA, the Zogoflex is guaranteed to be tough for the most ferocious chewers. Expensive treats that you buy for your dog are promised an extended life expectancy with the West Paw. The toy fits any type of dog treat of any size. You can also choose from three colors, Tangerine, Aqua Blue, and Granny Smith. The West Paw Zogoflex Qwizl is designed to hold the treats securely tight inside the toy to keep your pet fairly challenged during play and feeding times. However, one of its most alluring features is the fact that it floats, thus making it great for water play. Dogs love it and many of their owners enjoy being creative with what they put in the dispenser. Just keep in mind this toy only comes in two sizes, small and large. — Hide and Seek for Dogs! Outward Hound brings a unique and innovative design to the dog toy market. 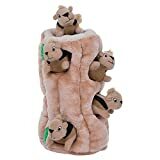 It features interactive, hidden squirrels inside a soft, plush tree trunk. You and your dog can happily enjoy a game of Hide-N-Seek and appreciate the softness of the toy as your dog bites, squishes, and throws it around with fervent energy. Your pet will go crazy with curiosity as the squirrels find their ways in an out of their hiding holes and squeaking away. Such boredom busters for dogs provide the cognitive stimulation your dog needs as it serves as a puzzle as well as a physical workout. This Hide-A-Squirrel toy makes a great fetching toy. Available in four variable sizes ranging from junior to ginormous, you can rest assured that your dog's level of play will be greatly accommodated. The biggest size available, ginormous, provides 5 hiding spots that will keep your pet continuously on his toes for hours on end. On the downside though, you may not want these toys to turn into your dog's favorite chew item as many users have claimed they tear after a while. Keep in mind this toy does contain stuffing. Dogs love tugging. So, when it comes to dog toys to keep them busy and always coming back for more, the Buddy Tug-A-Jug ingeniously implements a multisensory function for your dog with a tugging mechanism introduced in an interactive treat dispenser. Your pet will be able to see, hear, and smell the treats all in one. This allows your dog to have its play and eat too. It's made with a non-toxic material for maximum safety and is crafted for ultimate durability. This Tug-A-Jug is ideal for dogs over 40 pounds. The PetSafe is easy to set up. Just unscrew the container, fill it with treats, and latch it back on. The device works by your dog's tugging action on the rope, so as he tugs the treats get slowly dispensed. These meal-dispensing toys are available in a variety of shapes and sizes to suit your dog's taste and size. It's easy to clean and safe for the dishwasher, just make sure you leave it on the top rack. Some users complain of the thread rope not allowing much of the food to dispense. — Smart Toy To Keep Dogs Busy! When shopping for the best toys to keep dogs busy, the Trixie Flip Board has you covered. This is not your ordinary treat dispense, in fact, it's filled with more hurdles and tricks than most other brands. This board is customized to provide your pet ample mental stimulation and physical exercise. It provokes his strategic faculties and lets him practice his cause-and-effect reasoning with its pop-up features and side-to-side flaps. The treats are well hidden, so your dog has to work for them and some of the cones require your dog to manually lift them. Although this board should suffice for any dog, it works exceptionally well for the smaller breeds. The rim is firmly protected with a non-slip rubber material to keep the board from slipping and dragging. This is ideal for the intermediate player as it provides quite a challenge while allowing him to expound on his energy. To keep your dog from getting bored after figuring out the mechanism, challenge him by letting him move up in levels. As mentioned, this may not be suitable for large dogs but Trixie has a wide range of smart toys adapted to dogs of different sizes, shapes, and ages.